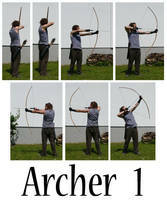 I have no archery training; `jademacalla was kind enough to allow me to use his bow and give me some basic tips. Thus, these are probably not accurate references for a skilled archer. These photos were taken with a non-realistic approach to archery in mind; they are more geared to the magical and the fantasy. Please consider this when using them for reference. Please refrain from making comments about the model's ability. I am already aware of the shortcomings of the technical aspects. Download for full res on all images. Big thanks to `jademacalla for the photography on these. And, whatever you do on Tumblr ! Please check out my USB drive of stock! ryuu ga waga teki wo kurau? thank u!! I love you! These are amazing. I need some dynamic poses for cover art and while searching Hawkeye, Arrow, Crouching Tiger Hidden Dragon,... I came across these. I marvel at your ability to jump around with pointy things. I would probably loose an eye. ☺️ Thanks. haha yeah it was challenging, glad it looks helpful! Wonderful! Again you've provided an excellent reference for what will no doubt be a recurring theme in my and others' arts. Thanks, Senshi stock! I always go to your gallery first when I struggle with a pose or have no inspiration, you have such an awesome variety of dynamic and natural stock. ^_^ your stock images are very helpful, keep it up! I actually really love what you guys are doing, because positions for me are really hard to draw, so it's really nice that you all are doing this because you have references at your disposal to use and in abundance. I will use these to practice poses thank you so much for doing this! 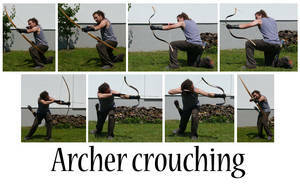 Bow and arrow are my favourite weapon! I'm defiantly going to use one of your poses! I've been spinning some ideas in my head as to how to do a drawing of my archer from the game, City of Heroes. I'm glad you've posted these. Now I can "revive" Be'erah in artform. Thank you for these great referance pictures..
but the results were great! i personally thought you used some kind of line or, something at first, but then i realized that that was the real deal! definitely! id say the same thing! And I commented twice for some reason owoU Sorry for that. It's not easy to find such great stock! Thanks for the great job. No problem - thanks again for the great reference.